The groundbreaking BMW i3 and i8 are exciting, break the mold from the company’s traditional designs and are finally headed for production. BMW is growing its range of electric cars, EV and plug-in hybrids, PHEV after its initial and pragmatic stunts in the electric propulsion arena. With the revelation a few years back of its stunning i8, it also introduced a more sober all-electric city car i3 that will also be available with a hybrid option. While many only expected those two cars to stay at the concept stage, it seems the Bavarian company has gotten serious about producing them. 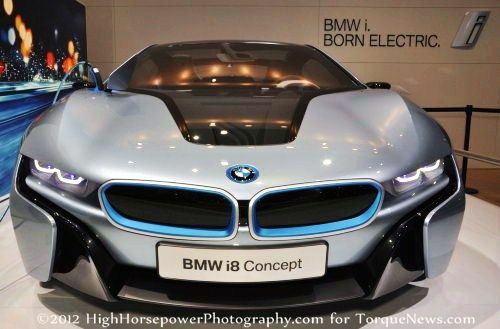 Both cars are stated for production sometime around 2014, with the i3 eventually coming earlier. In order to keep the momentum going and the enthusiasm pouring, the Munich-based carmaker wants to be sure consumers see the brand as serious about the electric drive platform by releasing a new official video showing off the i3 and the i8. The i3. The i3 will come in two flavors, full electricity or hybrid. The electric range for the pure EV is 80 to 100 miles. It will also be available in a hybrid version that will come with a traditional onboard internal combustion gasoline generator to recharge the battery pack and extend the range. We have seen some cute marketing names in the plug-in hybrid industry, ranging from ubiquitous Extended Range Electric Vehicle, EREV, to those who wanted to differentiate themselves by naming theirs Electric Vehicle Extended Range EVeR but BMW has then best one yet with the pragmatic, yet to the point Rex that stands for Range Extender! Here is where the company is making a difference, BMW is doing everything it can to keep the cost down by targeting a tentative price $35,000 for the battery-powered versions. This is no small feast considering then brand’s normal gas engine cost. Both cars are riding on modern structures that usually commend higher tag prices. Technically Speaking. Both cars are based on a light but highly resilient carbon fiber reinforced plastic, called CFRP for their body structure. The company has dubbed it the ‘Life Module’. The rest of the chassis rides on an aluminum platform. We can extrapolate at some point the Mini will share its underpinning. Does that mean we will see a hybrid Mini or how about an electric one? Nonetheless, BMW stands to make ample use of this platform, from its own cars to the other brands it currently sales. Weighing in a 2,800 lbs, about 800 lbs more than a conventional Mini, the i3 is longer, larger and taller than a Mini One. Using a sporty 168 hp pumping out a healthy 184lb ft of torque, the electric motor should propel it from 0 to 62mph in 7.9 seconds. The company says the i3 should be able to handle a 50 to 75mph rolling acceleration in just 6.0 seconds. Its maximum speed has been electronically limited to 93 mph. A complete charge on a 220V line should be handled in 6 hours, as well as a fast charge of 80% in one hour. One aspect to like about this EV is that you will be able to tweak your regenerative braking. In other words, you will be able to cost down a road without having to dose you accelerator pedal. In this mode, your battery pack will obviously not recharge but you should be able to glide for some time. The i8. Much rides on the success of the i8 coupe, on the other hand, despite a serious tone down from the original stunning prototype introduced at the Frankfurt Auto Show. BMW wants to keep its signature branding by emphasizing high performance as well as keeping with an environmental sensitivity with its i8 hailed as its flagship. Technically Speaking. The plug-in hybrid will sport a three-cylinder engine that powers the rear axle. The front mounted electric motor will power the front wheels. The lithium-ion battery pack will be housed in what the company calls the “energy tunnel”, which is the central tunnel in the middle of the car, between both axles and seats. This will help give the i8 a lower center of gravity with an almost perfect 50/50 weight distribution between front and rear. The i8 will be no slouch either with a projected 0 to 60 in under five seconds. Its top speed should be about 155 mph but yield as little as 78 mpg. Not bad for a performance car, considering the current gas versions easily 3 to 4 times as much. While we all wish BMW would have kept the plug-in hybrid i8’s breathtaking free flowing aerodynamic lines from its introduction, the final product looks great and there is no question its sister i3 electric car will also find a market.